However good other places can be, they still only offer you a room in a place you share with others. A couple of minutes away from the Main Square Jema ElFna, our riad offers you calm and accommodation for 4 persons. We want to provide your little LUXURIOUS paradise in Marrakesh: so we give you the full Riad to yourself and you can start to fully enjoy the peace and the tranquility of the Ancient Medina of Marrakesh, located just a stone-throw away from the hustle & bustle of the souks. -1 large terrace with dining room shaded by a pergola, view of the Altas and the Koutoubia Mosk, sun deck, & lazy tent. Concierge assistance over the phone + FREE WIFI INTERNET ACCESS. PLEASE NOTE: NO LOCAL GUESTS ALLOWED UNLESS THEY HAVE A MARRIAGE CERTIFICATE WITH ONE OF THE RENTERS. THIS RULE IS VERY STRICTLY APPLIED. In 2007 I decided to take a break to refurbrish this Riad which was in ruins. I wanted to create a space of tranquillity, calm and relaxation in the midst of the madness and frenzy of the Medina of the Marrakech which I fell in love with since the year 2000. I love to this of my customers as my friends and guests and absolutely enjoy to prepare for them a luxurious and calm environment to ensure their holidays are relaxing and memorable. My team and I want to offer to you and enchanting, fresh, calm, relaxing house in Marrakech right in the centre of the Medina, 2 minutes away from the Main Square Jema El Fna. You cannot be more centrally located: we are just 200 years off the Main Jema El Fna square in a quiet side alley. A superb terrace with views uninterrupted over the roofs of the Medina with the Atlas in the background. An exclusive rental with personnel on site. An exceptional location only 200 yards away from the Jema El Fna main square. Calm and peace. All bedlinen and towels are supplied and regularly changed during your stay. There is a local dry cleaner very near by: just give your laundry to Fatima and get it done in the next couple of days. Every evening during the cold season, Ahmed comes and lights up the fire for you. There is a local secure car park nearby should you need it. There is a charge to be paid directly at the car park watchman. Toutes les serviettes, linge de maison est fourni et changé durant votre séjour. We supply a couple of board games that can be used for your enjoyment. A couple of golf courses a couple of miles away. Completely as advertised. The Riad was comfortable, quiet, and beautifully furnished. The service was terrific and food prepared by Fatima and Zohara was a real highlight. The ability to enjoy the sensory overload of the Medina right outside the door and then retreat to this oasis made for a very enjoyable week. The Riad was fine and central to the main square (Whitch has to be visited at night) the only problem could be for elderly persons is there are two sets of narrow stairs without a hand rail up to the first floor and roof terrace which isn't mentioned. Pierre was very helpful and kept in touch most days. Pierre was very helpful to create a very special time at his place. He helped coordinate a very special dinner and Fatima and Zohra were so helpful and very friendly. We really enjoyed the meals they provided for us. Since this was our first trip to Morocco we were not sure about what to expect. 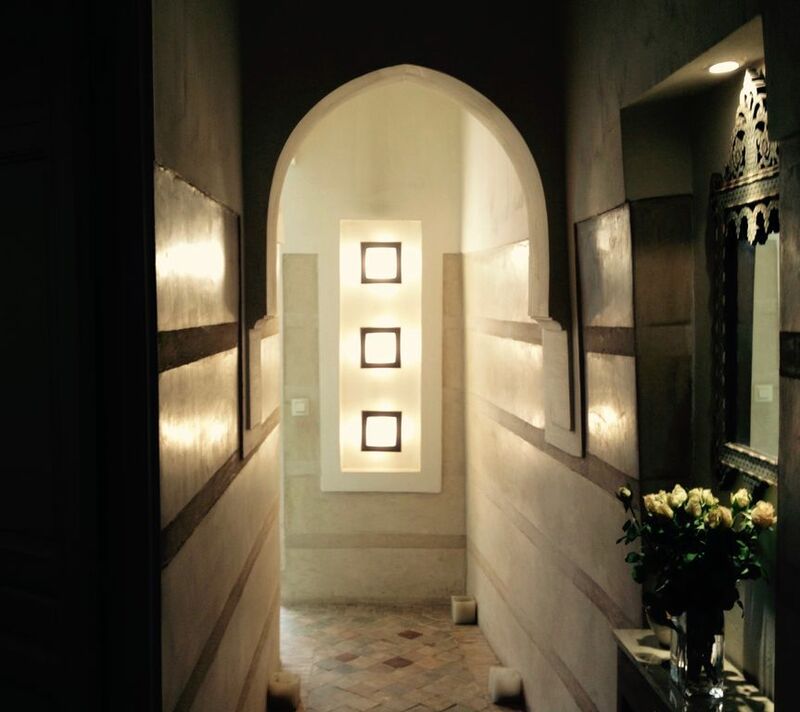 We felt very comfortable at the Riad and the staff were very accommodating to make sure it was a great memory. This is very centrally located close to the main square, easy walking distance to the places we wanted to see in the old Media. Thanks very much, I would highly recommend this property. The most perfect place to stay in Marrakech. We have wanted to visit Marrakech for a long time but wanted a Riad to ourselves. This 2 bedroom riad is the perfect solution in every way. The property is sensitively renovated and very authentic. The location is perfect, with Jemma el-Fna Square literally 3 minutes walk from the front door. There is also a bureau de change round the corner (all Banks and BdC offered the same rates within 0.3dhm so no point shopping around). There is a wide selection of restaurants throughout the Medina all within a 15-20 minute walk. My tip would be to avoid the restaurants on square. Breakfast was plentiful and fresh each day, lunch was fabulous and we had dinner in the Riad on 2 occasions. Fatima’s cooking is at least as good as, if not better than, most of the local restaurants. We ate at Naranj and Les Cantine de Gazelle, 2 top rated restaurants in Trip Adviser and they were no better than Fatima’s cooking. Finally, communication with Pierre, the property owner, was very efficient and informative. He responded promptly every time we contacted him during the booking process and in the lead up to our stay. The week before we travelled he sent emails with loads of information and recommendations on what to do and where to go. He made all the arrangements we needed for airport transfers and drivers for any excursions we had booked ourselves. He was happy to help with everything to ensure our stay was stress free. If you want to visit Marrakech but have any apprehensions then this is the place to stay. This was one of the best experiences of my life and I would recommend Pierre, his Riad and his team very highly. We enjoyed our 8 night stay at this lovely, well maintained Riad. The staff, Fatima, Zohra and Ahmed, took great care of us and we especially liked the delicious meal that Fatima cooked for us. The riad is conveniently located and is about a 2-3 minute walk to the main square. The rooftop terrace is a wonderful place to have have breakfast or to unwind after a busy day in hectic Marrakech. The owner, Pierre, was very responsive to our questions and even called a few times to make sure that everything was going smoothly. Highly recommended! We spent 4 nights , arriving on an evening flight . Pierre had given useful advice beforehand and remained in touch during our stay. We were met at the airport and it is a short drive to the Medina . Ahmed led us through narrow streets and alleys to the Riad where a meal was waiting. We had a tour of the Medina the next day , the following day a trip to Imlil , and on final day explored more of Marrakesh. Pierre's transport and guide arrangements worked perfectly . Dar Yaoumi is very well located , it was clean and everything in working order . Small shops and a money change bureau are within a minute walk. Fatima , Zohar and Ahmed took good care of us with a mixture of French and English . We had two evening meals in the Riad and ate in restaurants in the main square on other evenings . We had a most enjoyable stay and can recommend this as a good place to stay and especially the support of local knowledge and contacts so you make the most of your visit. Many thanks to Pierre and his team. Thanks so much Thomas for choosing our riad and I am so glad we met your expectations.